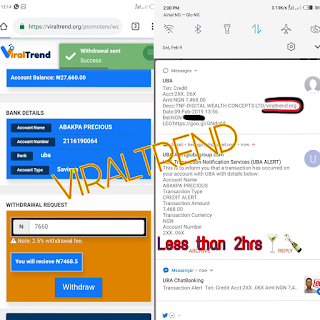 BEFORE YOU COULD SAY YOU WANT TO REGISTER FOR VIRALTREND, YOU MUST EITHER HAVE 500NGN OR 2500NGN. once you click the link above you will see something like the picture below. Fill the necessity. Then Click Get Started. Verify your Email. Go to your inbox of the email, you have put down. 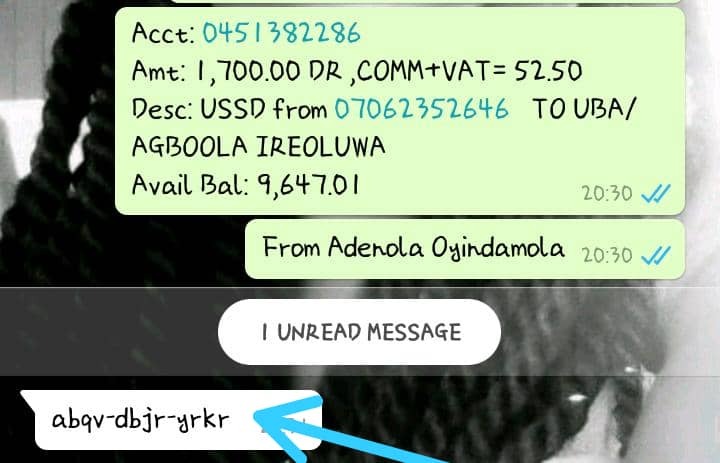 Like you have seen in the pix below you have to connect your social media to it. Remember that it is those social media you have connected that will see and perform their task. 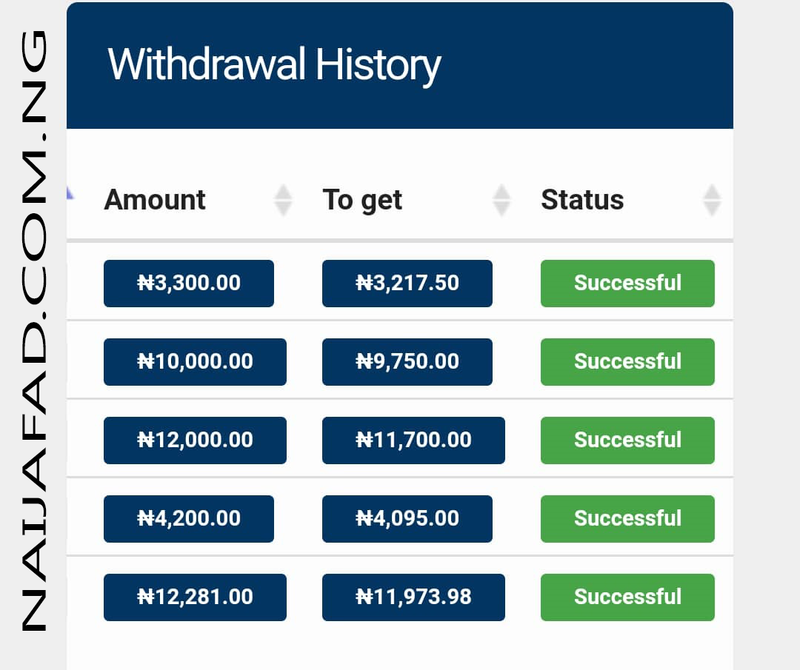 Now this is where you will decide where you want to fall into either it the 500NGN or the 2500NGN. The differences between the two is the Referral Bonus. 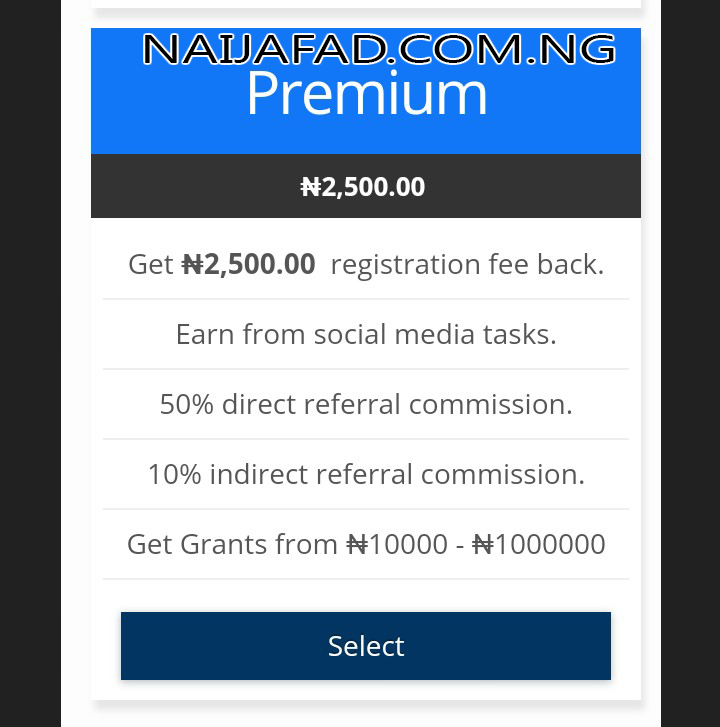 For 2500NGN, you will be given 50% direct referral bonus and 10% indirect referral bonus. For 500NGN, you will be given 30% direct referral bonus and 5% indirect referral bonus. 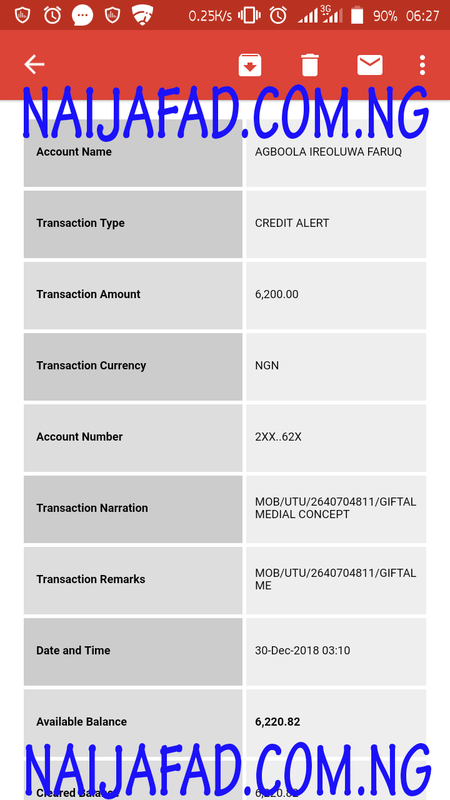 If you are a type that love to refer, i will advice you to go for 2500NGN, in order to enjoy your bonus more. 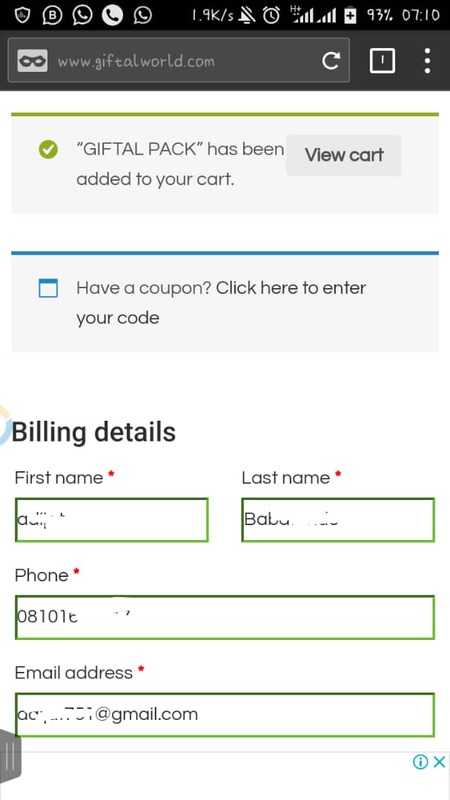 STEP 4: Choosing your payment method. There are just two method which you have to choose. ONCE YOU HAVE PAID YOU ARE FREE DO SOME THE TASK GIVEN AND START EARNING. 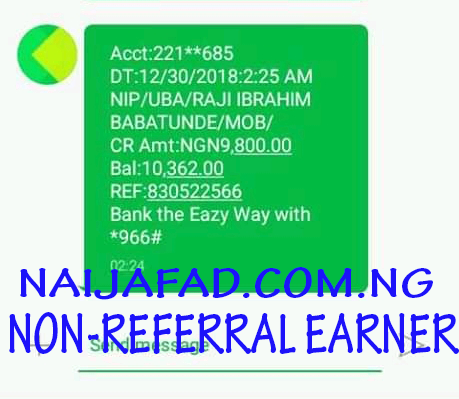 YOU DO NOT NEED REFERRAL TO GET PAID. Do you want to earn with your Social Media. Why not join Viraltrend today. Let See Maybe this is what you are looking for. 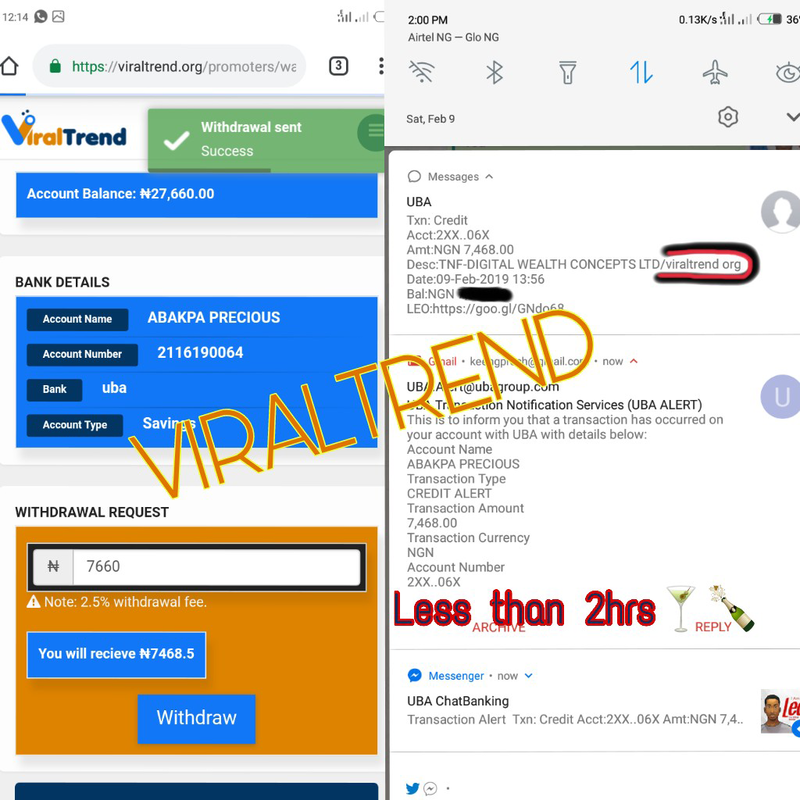 How to register for Viraltrend? 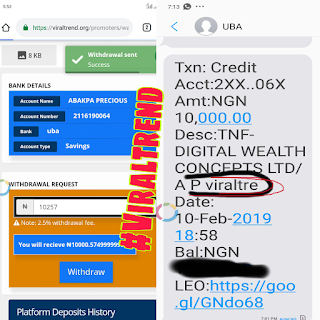 ViralTrend was invented by Prince Legacy Wealth Omogie, a Nigerian social media influencer and President of D Youth Project Nigeria. You can check him out on Instagram @legacywealth1. 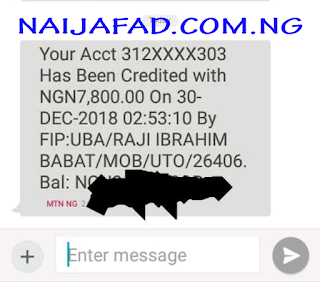 Do you know you can earn from your social media through this. ViralTrend is a well-designed platform that pays its users to perform specific social media tasks and refer others. This enables you the full access for daily tasks. You are then credited for every successful task you have perform. 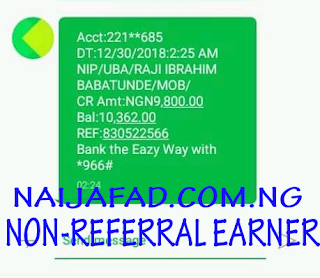 Moreover you do not need Referrals Before you can withdraw. 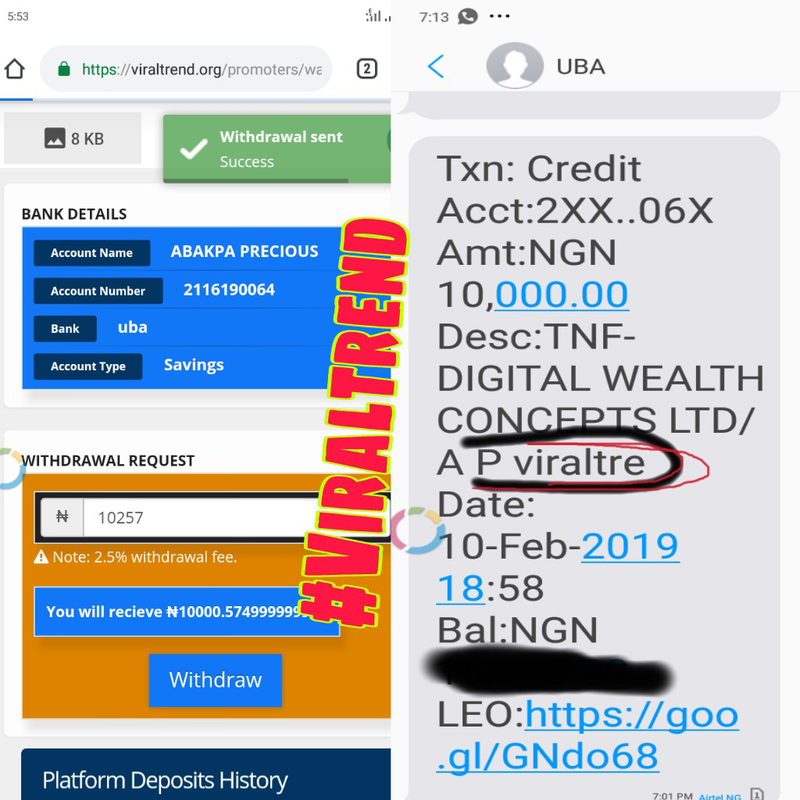 Viraltrend is legit. Moreover you can say your in the comment box. Truly everyone wants to make money. But everyone is scared for the sacrifices. Well, Giftalworld Talent Hunt claims that they have come up with a way to do that. Learn more about Giftalworld, what it offers and how you can register for it (if it is something you are looking for). Check out this article and find out everything you need to know. Is Giftalworld Legit or Not? Do Giftalworld Pays without Referrals(Non-referral)? Giftal Media Concept was created October 26th, 2018 by Nigeria Blogger, Raji Ibrahim (Ebright) under the legal Protection of GIFTALWORLD TECHNOLOGIES. 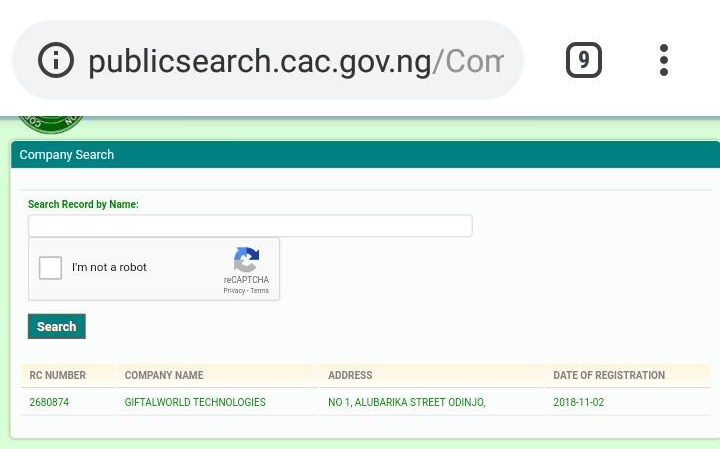 Its Registered under CAC [Cooperate Affairs Commission] with RCN 2680874. A proficient online business. 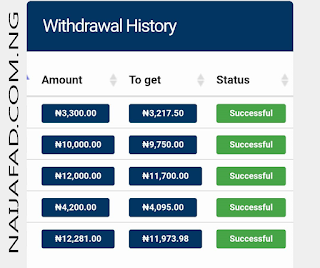 You earn ₦300 bonus funds when you successfully register your account. 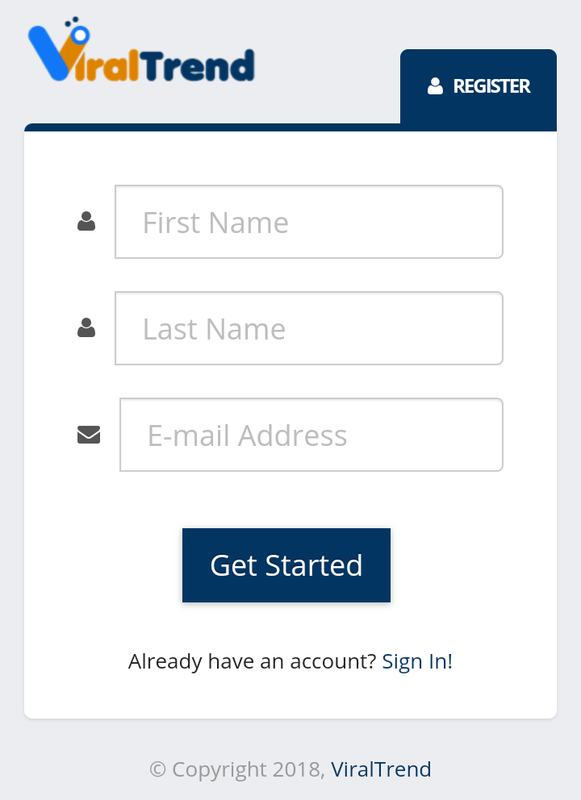 The funds would instantly reflect when you access your account area. This is the welcome bonus attached to you for thanking you for registering on the platform. You earn ₦50 for sharing SPONSORED POSTS to your social media handle for the day. SPONSORED POSTS are paid promotional post on Giftalworld. 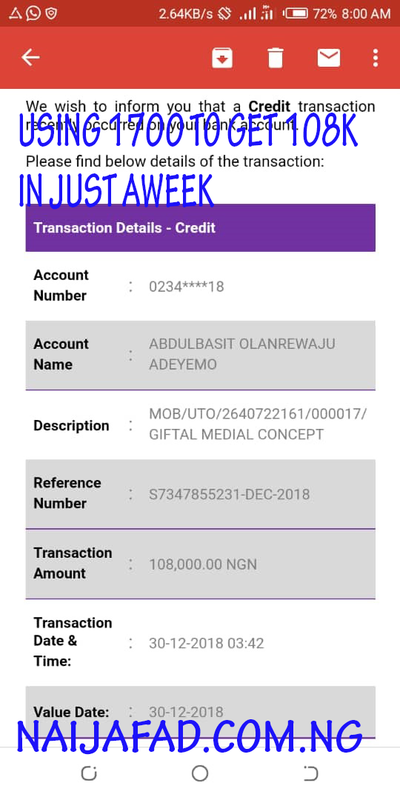 You earn ₦100 on Every Nice, interesting and educating video you upload on Giftalworld.com upon Approval. 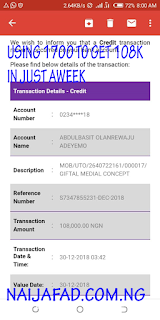 You earn ₦100 for writing Articles and News on Giftalworld. In Addition, This is for compensation. Moreover, Do you know you can win many gadget like Smartphone, any others through Giftalworld. You may be thinking the earnings are low. 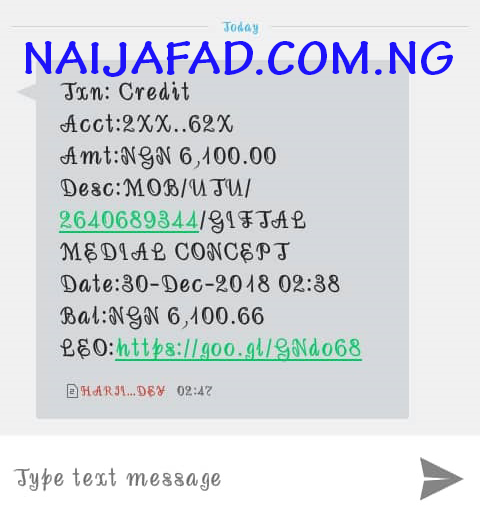 Moreover they pays without referral. This website is real because they want to keep their stand and promise. You will see many website that their earnings are very fast but later never pays non-referrals. Which is because the earnings is more than the revenue generated on website, so Non-referral suffer the case. Giftalworld pays Monthly, GAS(Activities on the website) Monthly. 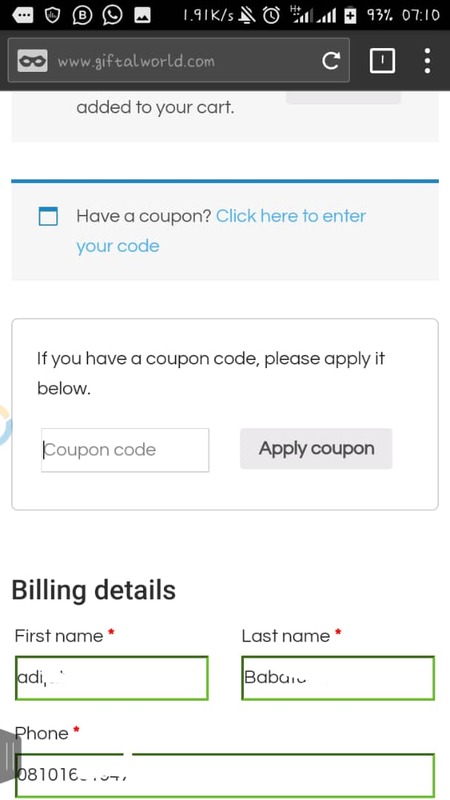 This is a sign that Giftalworld Pays Non-referrals because everyone will have to be paid at the end of the month. 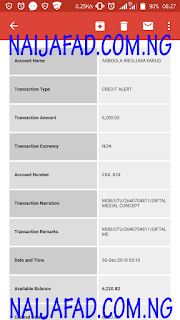 There are a lot of payments proofs on giftalworld. They pay weekly and will always pay. 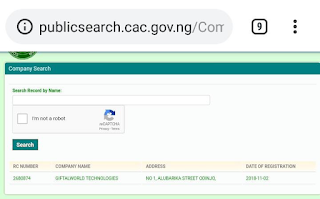 This is the certificate that Giftalworld is registered and is here for us.